For weeks, WRKO afternoon drive - time host Howie Carr has taken to the airwaves to mock onetime House Speaker Tom Finneran, who is now the AM station's morning personality. Yesterday, Finneran decided to fight back, using his slot to slam Carr for years of attacks on him and a long list of other politicians. "My colleague here at 'RKO is a phony, my colleague at 'RKO is a fraud, he's a pompous windbag," Finneran said during his show. Bad blood can make for good ratings, and many have wondered whether the on-air feud is a stunt to get attention for the station. Certainly it made last night's InterContinental Boston party, at which the station formally introduced its talk-radio lineup, more than your typical corporate affair. Highlights from recent bitter exchanges were played as part of an audio reel of WRKO hits. And when they appeared together, the radio hosts delivered zingers like practiced comedians, not bred-in-the-bone enemies. Finneran had been working the crowd for more than an hour-and-a-half when Carr arrived just before 7:30 . "No need to referee," the former legislator announced in a hallway outside the party. "Anything you say can and will be used against you in a court of law," Carr answered back, in reference to Finneran's recent guilty plea to an obstruction of justice charge . "You've got to admit he's good," Finneran remarked to a station official. On stage during the party, Finneran read a short poem, while Carr used his turn in the spotlight to continue joking about Finneran's legal travails. (Of the large bandage on his forehead, Carr said it was just minor surgery for melanoma). Both men as well as station executives denied they were out to generate publicity. And Carr's attacks on Finneran are nothing new. For years, Carr has called him "Tommy Taxes" in his Boston Herald column, along with "bum," "hopeless hack," and "tin-pot tyrant." But a joke by Finneran during an on-air chat with Governor Deval Patrick last week prompted Carr to take his gripe beyond the newspaper or WRKO. On the air, Finneran, referring to the controversial decision by Patrick to have a Cadillac leased as his state car, said: "Hey, I've got a proposal for the governor. 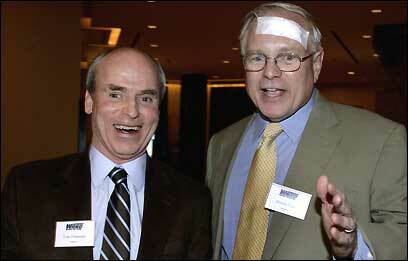 The governor and I are going to take Howie Carr for a ride. Three will leave, only two will come back. We'll take a little pool on who it is." That prompted Carr to write US District Judge Richard G. Stearns, who sentenced Finneran to probation in January for misrepresenting his role in a legislative redistricting that diluted the clout of minority voters. Finneran pleaded guilty to one count of obstruction of justice. "As someone who has been threatened in the past, I felt law enforcement should know about it," said Carr. "He should have been in prison to begin with. I don't think his rehabilitation has been going well." Finneran, reached yesterday by phone after his shift, said his producers urged him to attack Carr on Monday. But Finneran said he didn't feel comfortable doing so. Then, on Monday afternoon, he listened as Carr launched into another wave of criticism. "Nobody meets Howie's standards for approval," Finneran said. "I just decided [to] point out to my audience . . . who has made a career of beating people up for things mostly out of their control. Look at what he's said about [former governor] Jane Swift. He's called her fat and dumb. And you know what he says about [Mayor Thomas] Menino. It's just not right. And the sign of a bully. Then the first time somebody, me, makes a little joke, he's like a crybaby." During Finneran's show, some callers phoned to offer support. Others said they sided with Carr, and told the talk-show host he should be serving time. Jason Wolfe, vice president of AM programming and operation for WRKO's parent company, Entercom Communications , said he had no problem with the conflict. "It's incredibly good radio," Wolfe said. Michael Harrison, publisher of "Talkers" magazine, which covers the radio industry, agreed. "They may not like each other, but the fact is they both could benefit greatly from not liking each other," Harrison said. "Folks are talking about the radio station again."